One of my favorite ways to use Thieves is by making Thieves Tea! Add 1-3 drops (to taste) of Thieves Vitality to warm water with either lemon juice or 1 drop Lemon Vitality essential oil and mix with a bit of honey for a warm comfort. We love the Thieves cough drops especially! Love, love this oil!! I use it 3x a week by putting 1 drop of thieves oil into 4 tablespoons of Dr Pepper. That sounds yummy. I’m going to have to try that. Love Thieves! Thieves Amazing! No more words needed ? I love love love the cleaner. Love Thieves Essential Oil! I make a spray for cleaning surfaces and deodorizing the air!! Thieves us great to put in a scarf around your neck while traveling on an air plane. My family loves the Thieves products. From toothpaste, household cleaner, hand soap, hand sanitizer and so on and so on. We use and live them all. Having a large family and now grandchildren, it has been a blessing watching our children’s families love and use them as well. So very thankful!! Thank you, thank you for your dedication & passion for this product alone! Without Thieves, well, just imagine! 25 years I wish I had known!! I hope to have another 25 to share the love, one drop at a time!! love it to clean everything!!!!! I love using thieves cleaner and have shared it with so many of my friends. So thankful for a cleaner that does not expose myself or others to harsh chemicals. I have not had the chance to try thieves laundry detergent or dishwashing soap, but they are next on my list! I love to use Thieves Essential Oil in our DIY hand soaps with Castille soap and water. It always smells amazing and is so simple! I also love to diffuse it this time of year for how cozy and warm it smells. Shared to win. LOVE thieves!! I LOVE the Thieves Cleaner! it is so versatile! One of my favorites is to use thieves and orange in my diffuser during the fall and winter! I love Young Living-they are exceptional! I would love to win this! And nothing beats the smell of Thieves, Orange, and Nutmeg in the diffuser. I love to make a spray in a 2oz bottle that I can carry when traveling. It has changed our experience to maintain wellness while traveling and gives us great peace of mind. Love Thieves. Thieves is definitely one of my favorites, and absolutely my husband’s favorite. I can’t imagine life without thieves! It’s an amazing oil that can do so many things! I love my thieves household cleaner!!! I really like cleaning my hard wood floors with it. My favorite Thieves product has to be the hand purifier. It comes in handy at work where I handle a lot of money. My 11 year old Daughter & I love Thieves! I love all the thieves products, from brushing my teeth, mouthwash, thieves oil. My son’s and husband’s dirt laundry thieves laundry soap. Also my thieves body soap my oh my I love my thieves cleaner. I have to have this because i have little boys and a mom who sure know how to dirt up a room or Toilet. Love my Thieves up, down and all the way around. Go Thieves Go. Thieves is the oil that got me started and we absolutely love it, especially this time of year! !Praise Thieves!! I love Thieves Household Cleaner. We don’t go a single day without Thieves! Toothpaste and mouthwash, Thieves essential oil on the bottom of our feet, Thieves Household Cleaner for a really clean home, and Thieves Fruit & Veggie Soak in the kitchen! Thieves products have replaced all the chemical-laden products in our lives! Theives is my familys all time favorite oil! We use it for almost EVERYTHING. With 3 rowdy boys it is my go to for cleaning! In fact they love it so much they share their hand sanitizer at school. Thieves is my favorite! ? My favorite thieves product is definitely the hand purifier. I work for a bank and handle money all day long. Thieves is by far my favorite essential oil! It’s so versatile and the scent is amazing. My favorite item is the Thieves cleaner. I use it for EVERYTHING! We love Thieves for just about everything in our household! I loves Thieves EO! I love it in a roller on my feet at night before I go to bed and in the morning after I shower before I go to work. It’s a very versatile cleaner. This is the oil that sold me on Young Living. I absolutely love this oil! Not a day goes by that I don’t use it! Every morning drops in my warm lemon & honey water, it’s like a soothing tea! I loooove using thieves in the diffuser daily and in a roller to roll on my family as we run out the door to boost. I like to use it topically mixed with a carrier oil. Especially when I have a cold I use it on the bottom of my feet. I love Theives! We use it in our diffuser daily and use the products as well, we love it!!!! I use Thieves daily on feet, in air, and cleaning! I absolutely love Thieves! It is a must have in this household! Everything from the oil to toothpaste to hand sanitizer to household cleaner to foaming hand soap to dental floss to the spray…… I could go on and on! We love thieves everything! From brushing of teeth, to in our juice, to cleaning the house, will never go with out it. We are never without Thieves EO, Thieves Vitality EO or Thieves Household Cleaner! Powerful stuff, yet safe! My favorite Thieves product is the Thieves cleaner! Makes the house smell so good top to bottom and can be used in every room, more bang for your buck and no harsh chemicals. Love using Thieves products throughout my entire home as we made the switch to a more chemical-free life! The original thieves blend is my favorite because it’s so versatile. I use it in my cleaning products & my foaming hand soap. Love Thieves on our feet this time of year! I love Thieves-diffusing it, applying it topically, and using it in my DIY cleaning products! I love thieves tea! I add thieves, peppermint and lemon vitality oils to my favorite tea. Also add honey to taste..such a great way to start your day and support your wellness! I love all the thieves products, of which I can not live without them. My favorite is the Thieves Household Cleaner because it works and smells fantastic. I love that I’m not inhaling toxic ingredients while cleaning. I absolutely love Thieves! It is hands down my favorite oil blend. And my favorite Theives product is the household cleaner. It is so versatile, I use it to clean my kitchen, bathroom, office, and just about any other surface. And it smells awesome too! I love Thieves,. Thieves everything! I’ll never be without it!! I love the thieves household cleaner, it’s all I use now in our home! Thank You Young Living for being in our lives! Really love thieves so much. Can’t live without it. I love thieves essential oil. It really works. My favorite thieves uses are of course to diffuse, use in tea when I’m not feeling well, to clean with, and I love to make rollers to keep my kids healthy. So many reasons to love thieves! This is my favorite blend! I love Thieves Aromabright toothpaste! My teeth am dying mouth have never felt and looked better. A drop of Orange is a great addition each brushing. Plus my kids and hubby love it too! Just began learning about all the benefits of Thieves! Love it!! ? Thieves Cleaner. Omg it’s the Best product out there. It’s the do it all (one stop shop) product. I love my thieves floss! And the hand sanitizer smells so good! I love thieves and so do my kiddos! Thieves has been my favorite oil since the day I received my kit! We love the Thieves line! We use and make our own Thieves hand soap, love the sanitizer and household cleaner. Now that the cold season is coming we have been putting it on the our feet and diffusing pretty regularly. LOVE IT!! Thieves is one of my favorites!! I love adding it to tea, making a homemade cleaner out of it, using it in my laundry and using it on my skin. It smells amazing and takes care of everything! Thieves cleaner is my favorite. It smells soooo good. I love the way diffusing Thieves makes my home smell!! The oil blend is my favorite! My favorite way to use thieves oil is in my kids diffusers. I also like to add a drop to a carrier oil and rub on the bottoms of their feet when they leave the house. Thieves oil is my absolute favorite oil to have. My first oil inspiration was Thieves! So happy on the results of wellness in our home. Thieves is my Favorite YL Essential Oil!!!! Thieves Rocks! Even the least oily person has heard of Thieves and it’s benefits. Won’t ever go without it! Thieves essential oil is my favorite. My favorite way to use it is by diffusing it throughout my house. I love coming up with different oil combinations to diffuse with Thieves but it is also great on its own. It’s comforting and energizing at the same time. I love diffusing thieves and orange in my house all the time. I have a daycare in my home and thieves has been a blessing to many families in my home. I Love making Thieves tea. Theives ,Lemon an honey. It has kept me well along with Inner Defense. Theives household cleaner i cant get enough of. My husband loves using and suggested we make a spray bottle for family members so i just ordered a bottle. He loves the fact we can use it for everthing and its not harmful to our many (9) rescued dogs. I love Thieves in the diffuser. It was the first oil I used from my starter kit and I believe it will alwsys remain my favorite! I only clean my house with Thieves. I love it! I love the household cleaner. I use it everywhere in our home! I love Thieves and am now changing my cleaning stuff to it as well! I love Thieves!! It keeps my house clean and my family healthy! I diffuse thieves at school and use it to clean my desk and the student’s desks-best smelling room in the school! 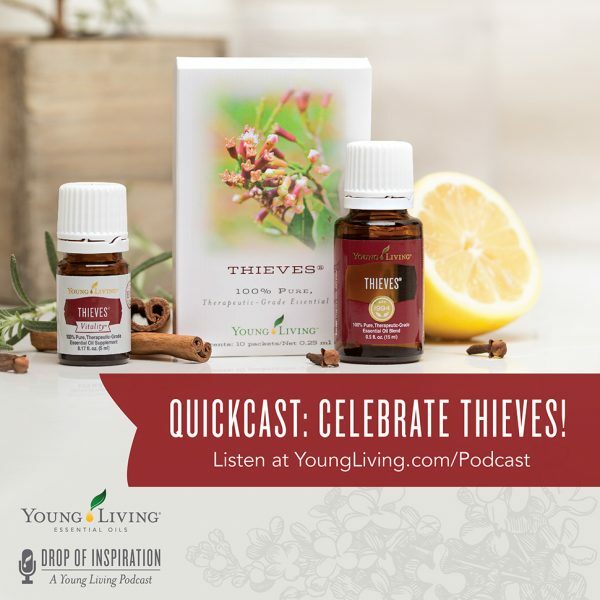 Thieves is one of my favorite YL essesntial oils that I use everyday!! I have even shated this wonderful oil with friends!! Love it. Thieves is the best! We use it to clean, freshen the air, and add a boost. We love thieves! I just signed up in September and I am enjoying Thieves oil on my feet, throat, in my DIY hand wash & diffusing . I love the Thieves cleaner! I love that I’m getting my home clean without harsh chemicals! It’s been a game changer! It was my gateway oil!! If I can only choose one of the Thieves products, I would choose the oil. Have Thieves will travel everywhere with me! I love all the Thieves line but I have to give a shout out to the Thieves mouthwash. Love the Thieves household cleaner for so many things! My favorite Thieves product is the Thieves blend itself! Really, I love all things thieves, but the oil blend has helped me keep my family above the wellness line for over a year now! If I had nothing but the blend, I could still make my own hand soap, chemical free cleaning solution, delicious tea, and amazing aromas around the house! Everything else is just the icing on the cake! I I swear I swear by thieves now thanks to my awesome sister in law. Thieves tea! Drop of Thieves with a drop of Lemon and honey. My favorite Thieves product must be the laundry soap. I just love how little it takes to make my wash extremely clean!! Love love love the Thieves Cleaner! My favourite way to use is to make toilet bombs! They smell wonderful, clean amazing and bonus – even my kids will use them! Thanks YL! I am excited to share this with my group. I have loved thieves since starting my journey with Young Living (less then a year ago) but after hearing Gary Young talk about it and the story behind it made me love it even more. I also like the cleaning tips. I have used the baking soda and thieves household cleaner mixture but not the carrier oil and thieves household cleaner for wood floors and furniture. I am excited to use the cough drops too. Just getting to know more about YL becoming a new distributor at the end of August and Thieves ia my favorite go to oil. I cannot live without the Thieves hard lozenges and cough drops! Thieves Household Cleaner is my very favorite!! I use it not only throughout my house but in my barn too! My horses and goats always approve to a freshly Thieves-cleaned water bucket 🙂 Sometimes I add a drop or two of Lemon EO for an added zesty-freshness! Thieves is one of my favorite oils! Love all the thieves, essential oil, cleaner,toothpaste, etc. An interesting story about Thieves. I look forward to trying it. Thieves EO and Thieves cleaner! Love my Thieves! My favorites are lozenges, toothpaste and household cleaner. Love thieves cleaner so much!! I love that my kids can help clean without me worrying about what they are using. Thieves is absolutely my all time favorite. Thieves cleaner..thieves toothpaste.. Thieves bar soap. Yep I am faithfull “thieveser” is that even a word? I love Thieves straight under my tongue and in my coffee with a tsp of coconut oil! I love everything Thieves! I have only just started using Young Living, but can’t wait to get and try them all! So far I have used the Thieves EO, Thieves Vitality and I love them both. I also started using the Thieves Laundry soap recently and it cleans like nothing else I have tried. Its amazing! I just ordered the Thieves Household cleaner and can not wait to use it! Can not wait to try that paste recipe. Thieves cleaner is my favorite. I love diffusing Thieves as well as putting it on my feet and drinking it in hot water mixed with honey and lemon. One of my favorite oils! I just started using yl oils and love all the oils I’ve tried so far! I’m trying to replace all my toxic cleaners with thieves house cleaner. I love the smell of it. Thieves is one of my first “loves” from Young Living! I have ditched all chemical cleaners, toothpaste & many other household items thanks to this amazing product line! I love thieves! I’ve been a member for a month now and was ecstatic to receive my 15 ml Thieves! indiffuse it, and I also, have Thieves dish detergent and I do have a dish washer!??? I’d rather wash my dishes than run the dishwasher, why? Because I love the squeakness of my dishes and love the scent. I also have the Thieves Cleaner and threw out ALL the chemical cleaners!, yep sure did…. I love Thieves. And I’m looking forward to more of what I’ll be doing with this AMAZING?? product. I put it on my feet every morning…….. I love thieves cleaner, there is nothing it will not clean. I thought going chemical free would mean getting less, I could not have been more wrong. I clean my mirrors, furniture, bathroom, shower curtain, and even dust with thieves. I make up an after shower spray and use it on my bath and shower liner after I shower. Between the shower spray and the dust I clean half as much and my tub looks like new! I love using Thieves EO on the bottoms of my feet. I also put a drop or two on the sides of my neck, the way you might apply perfume. I absolutely love everything about this oil and the entire product line!!! Love hearing the detailed version of this story from Gary, I have only heard the condensed version before. I apply to myself and children every day! The cleaner is amazing! I always make sure to have a Thieves EO in the house! The Thieves toothepaste is the best as well!! Looking forward to trying the cleaner too! I love the scent of thieves. I use the oil in the diffuser and on the bottoms of my feet. I use Thieves household cleaner for just about everything. I love everything thieves!! It is a must have in our household and we diffuse it daily! Love thieves! My favorite is to use the household cleaner to get the crayon off my walls from my toddlers. I cant imagine my life without Thieves. I have every Thieves product that YL has. Cant get enough. I love the thieves laundry soap! I like to add several drops of Thieves to my morning coffee once a week! Thieves is definitely a staple in our home! I don’t use any other cleaner. From immune support, to oral health, to cleaning off baby toys, trays, car seat, and stroller (love that it’s nontoxic!! ), we wouldn’t be without this one! We do not go a day without using Thieves in one way or another!! We diffuse it each night , brushing our teeth, cleaning & washing daily. It is our #1 oil to have and use!! Thieves Essential Oil is what got us hooked on Young Living. Thieves really is an amazing blend. I’m pretty close to owning all the products in the Thieves line. Everyday I use the toothpaste, mouthwash, dental floss, and bar soap. I use the laundry detergent and dishwashing detergent too. BTW – the dishwashing detergent is AMAZING.That stuff works!!! Anywho… I send my son to school with the Thieves hand sanitizer and every Wednesday before I volunteer in his classroom, I take a capsule of Thieves Vitality. I diffuse it, I made a kitchen counter spray and toilet bowl cleaner… The list goes on and on. I am so thankful that I can use Thieves to replace so many toxic cleaners, o and bath and body products. Thieves is awesome. Young Living is awesome. I love all things thieves, but the household cleaner is my favorite. Love thieves everything! Especially a drop of thieves in my Ningxia! I LOVE Thieves!! I tell people the story all the time along with my personal testimonies of how Thieves has helped my family! I couldn’t pick just one product…the oil, household cleaner, hand soap, detergent…ALL my favorites!!! I started making a Thieves based mouthwash! Thieves is one of my favorite oils! Love to diffuse it school! I love diffusing Thieves and using it topically. I also love the household cleaner. I really want to get all of the other Thieves products, and, I will, but can only order a few at a time! I love thieves in a roller bottle for a boost. The whole family applies to our feet every day! Thieves household cleaner is my favorite! Thieves is my favorite oil and it is ultimately the oil that helped me get started using essential oils and Young Living. Thank you Young Living and Thieves. I posted the podcast on my private Learning How to Live the Oily Life member page. I love cleaning with the Thieves cleaning products. I am so excited to get the Thieves toothpaste in my rewards order any day now! I love thieves! I use it topically, in the diffuser, in my cleaning products, and i add it to recipes. It is by far my favorite! Thieves came in my kit and I diffused for first time last week. It’s incredible!!!! My husband is sold on it as well!! Wow! I love Thieves!! Cannot imagine my life without it! We love Thieves cleaner because we know it’s safe and not toxic around our pets and children! Thieves thieves thieves this ancient remedy is everlasting just as in the centuries before us!! My favourite however is thieves toothpaste, especially since I’m always on the run! This beauty can be used for teeth cleaning and as a natural deodorant!! Wow!! Very impressive and only need to pack one item when travelling!! ?? I’m new to YL, so I haven’t yet experienced all of the Thieves products. But I do love adding a drop of Thieves Vitality to my hot tea with some honey. YUM!! Looking forward to experiencing more of this line in the near future. Thieves is my favorite oil!! Use it everywhere!! I love thieves oil and thieves cleaner. I love Thieves EO! Thieves is so versatile and had so many uses that it is hard to pin point just one. Love Love Love Thieves! SO powerful! And the thieves household cleaner has been amazing me time and again! Love thieves on feet every night!! I recently used Thieves cleaner to make a cleaning paste. It cleared up some stains in my bathroom that NOTHING else would even touch! I love using Thieves in my cleaning mixes to make my home extra clean!!! Love Thieves! We are new to the EO market but my three year old already asks for it by name! We diffuse it daily! Great story for the origin of the name. Can’t wait to start incorporating the household Thieves items! Love ❤️Thieves. I have replaced all household products with the Thieves line. I LOVE THIEVES!!!! I use Thieves from cleaning my teeth to my toilets. There is nothing I don’t clean without using Thieves. I literally have a Thieves Household Cleaner spray bottle under each sink of my house and that’s the ONLY thing under my sinks.. It’s amazing! When I was first introduced to Young Living and the wonderful world of essential oils I chased my family around with my bottle of Thieves. From there I had to try the rest of the Thieves line and I love it all! Love thieves! its a super hero!! I LOVE making Thieves tea. 1 drop of Thieves, 2 drops of Lemon, and honey in a mug of hot water. Thieves is my first favorite oil. ❤️ I love all the things I can I can use it for. I want to start using all the Thieves products but want to start we with the cleaner next. I love Thieves for everything from cleaning to diffusing! We moved into a house with hardwood floors some time back. I have never felt that they were clean with the non-toxic cleaner I was using. This morning, I used the Thieves cleaner that came recently. I was right, the floors were NOT clean! Thieves got up all kinds of nasty stuff. It will take a while, but eventually, all the floors will be clean! Just started using Thieves and love it ? Nobody can go wrong wrong with the thieves household cleaner, especially if you are potty training a 2 year old! Also thieves tea is the bomb this time of year!! I have not yet tried thieves and this would be so welcome to win. I could really use som cheering up this winter. I love the laundry detergent. Clothes are so clean and fresh smelling without using any extra additives. Thieves is my all time favorite oil as it’s so versatile. From cleaning product to tea, it does it all. The smell is amazing and the benefits are over the moon. Using the vitality line, I take a drop or two of thieves added to some hot water along with a drop of lemon and peppermint is the bomb! Love Thieves essential oil ? Defusing Thieves is awesome! Win Win! Plus the multiple other ways to use it! All ways are incredible!!!! Love Thieves oil, cleaner and just purchased the cough drops! I love the whole Thieves Product Line! I use Thieves every morning when I brush my teeth. Just a drop on my toothpaste and brush! Thieves is definitely my favorite oil and I can’t go a day without it!!! I am new to oils….but I’m loving Thieves!! We love thieves in our house! In fact that is what is difussing right now! All. Things. Thieves! Toothpaste, Cleaner, Hand soap, cough drops, throat spray, and the oil blend. We love & use it all. I love all thieves products, it is the best blend! Thieves is the best, especially being able to clean my baby’s toys without worrying! I love using thieves hand sanitizer, diffusing theives. It’s the best. I love the smell of thieves… I was traveling on a plane and was dozing…every now and then I thought I was dreaming about smelling thieves…I looked over at the woman and she was obviously smelling something in her hands. I asked her if she was inhaling Thieves…she was so excited I knew what she had!!! Oh how I love ❤️Thieves!!! I’ve made hand sanitizer, foaming hand soap, throat lozenges. The cleaner has become a favorite in my family. It’s also the one I run out of a lot having 4 children, 3 of which are in school. Thieves is one my favorite oils. I use it everyday. I love to diffuse with Orange essential oil. It’s in my diffuser right now. I do not know how I have lived without Thieves! I use it everyday, from foaming hand wash to putting it on my daughter’s feet every night! I love Thieves! I love the entire Thieves line! I’m so happy that I ordered the Thieves kit with my PSK when I joined. Thanks for this awesome line of products! What a powerful oil!! I love the thieves blend! We use it daily in our house! My next favorite thieves product is the throat lozenges! I always have these in my purse, on my night stand, downstairs next to my oils… Anywhere! I don’t want to be caught without them! I’m so glad I was introduced to this company! You guys are amazing! I didn’t like Thieves at very first I have to admit but now I cannot live without it! Happy Anniversary! Thieves is my favorite oil! Thieves is thebomb.com! I like to add a drop of Thieves Vitality and Lemon Vitality to a spoonful of honey! I think my two favorite thieves products, as of right now, are the thieves oil and the thieves household cleaner! I love the household cleaner because it works! And it makes the house smell amazing! I love putting a drop of Thieves oil in my apple juice each morning to support my immune system! Love thieves! I use it mostly in my diffuser but I also enjoy it for dishes and putting 1 drop in all my heat vents. My favorite oil to diffuse and just starting to clean with it too!! I am new to yl essential oils and excited to keep learning new ways to use it!!! Thank you!!!! I diffuse at least once a week in my Home. I use a drop of Thieves Vitality in my shot of NingXia Red every morning. A Josh have in your stock. Two years ago a friend shared the Thieves hand purifier with me, that share was the beginning of my journey with YL oils. I was sold and I signed up and the first thing I ordered after the started kit was the Thieves kit. I love everything in the kit and all the other new Thieves products they continue to come out with. My favorite will always be the hand purifier, I share it with everyone and have sold more people on YL oils just by introducing them to Thieves. I dont leave home without it!! Thieves is my go essential oil, I love the smell and it has so many benefits. I am also replacing all of my home cleaning and laundry products with Thieves. Thieves has become my Favorite Essential Oil, besides Peppermint Essential Oil. Great Quickcast!! I just started using Thieves in 2015. I love the toothpaste, mouthwash, floss, spray, F & V Spray, HH Cleaner and the oil saves my life!! I love to drop the oil in my mouth and do a swish. It works great as a mouth freshener!!! I love Thieves! I never want to be without it!!! Love my theives it so versatile kitchen bathroom hand sanitizer My favorite way to use it is to mix a paste with baking soda and clean my oven love the aroma. Thieves Spray!! I have a potty training son so we use it ALL the time! ? I just love all of the thieves products. I use it on the bottoms of my feet and in my diffuser. Love the smell. I love all the Thieves products but my favourite is the cleaner! I have quickly become a huge fan of Thieves! I am currently diffusing it with Purification. Love the smell! I really like the essential oil and would love to win so I can try the other products. This is my favorite oil to use on my floors, in my laundry, spray my throat with,and wash my hands with. I use thieves EVERYDAY ! I love Thieves Household Cleaner. It is so versatile. A few ways I use it other than everyday cleaning – cleaning awning overhangs, cleaning my vinyl siding, cleaning off poison ivy. Yes I really did say it! Huge savings versus those specialized products. I love Thieves! My favorite product is Thieves Household cleaner! I love Thieves – especially at this time of year. I’ve only diffused it and made a topical rub. I’m curious about the cleaners and all these other amazing uses I’m reading hearing about! Thieves Line is the only cleaning products in my house. I love the smell. I love the thieves mouthwash!!! I also use the thieves EO in my homemade dishwasher detergent. Thanks for sharing the history of Thieves, very interesting. I love Thieves and use it to clean my floors, countertops, refresh my mattress, and various items. Love the Thieves toothpaste. Fascinating story about the 40 thieves! My favorite most ESSENTIAL oil by far not to mention the household cleaner, toothpaste, & mouth wash!!! I love thieves! I like to make a hot tea of thieves oil, lemon oil and honey. I also rub it on my kids feet at night! I love Thieves on my feet, toothpaste and floss. ??? I loved hearing Gary Young’s sorry of reading all these books while in England to help formulate one of my favorite oils! The theives aromabright toothpaste is my absolute favorite with the theives household cleaner in a very very close second. I love to use Thieves Fruit and Veggie wash on my produce. I eat apples every day and salad for lunch, so it’s important to me to have clean produce. I also love using Thieves Vitality for my Thieves Tea. Love thieves, the smell everything! Oh Thieves, you’ve stolen my heart, and replaced my cleaning supplies, toothpaste/mouthwash, fruit cleaner and help me live a happier life ? I have recently just began using the Thieves laundry soap and the Automatic Dishwasher powder. Wow!! I love the way they clean! Probably my two favorite Thieves products. I am currently enjoying a drop or two of thieves in my coffee. I love all things thieves! I would have to say the foaming hand soap is my favorite thieves product I use daily! Thieves is my all time favorite…I diffuse it and wear it in my diffusing necklace. The cough drops are the best and the mouthwash toothpaste and cleaners can not be beaten. I love the whole thieves product line! My favorite would have to be the essential oil. It is so versatile in its uses. All around goodness! I’m loving how my house smells after using Thieves Household Cleaner! My laundry smells fresh, I don’t needtremind my kid to brush & rince her teeth(because she loves the taste). Thieves is amazing! I love thieves for many reasons but especially the way it smells! Shared! So great to hear the story straight from Gary Young because I’ve heard different versions and so getting it straight from him is awesome! Love Young Living and love Thieves, it’s the one oil I won’t ever let my house run out of…. Thieves household cleaner and Thieves oil! I love them both. The smell is my favorite ands i love the versatility of both! I add 2 drops of thieves to my organic green ginger tea every evening. My 2nd favorite is using the thieves aroma bright toothpaste. It’s has helped me tremendously. I’m so addicted to this! Thieves oil is a must have in my home diffuser throughout winter. Also, the household cleaner is the only thing I use to clean anymore. Best around. LOVE Thieves!!!! It is a daily for our household. Who doesn’t LOVE Thieves? And who doesn’t need more of it in their lives? I love this giveaway, thank you! Shared and shared again! I love Thieves. Household cleaner was my first product purchase and I LOVE IT! Just got my hand soap and had to wash my hands as soon as it arrived! I love all things Thieves! I love thieves anything! I add honey and two drops of Thieves to tea! Love all the Thieves line, but the Thieves cleaner has been life changing! It has replaced all my other cleaning products! Windows, countertops, appliances,toilet bowl, floors, you name it, Thieves cleans it all! One of my favorite Thieves products is still the Thieves EO. My favorite Thieves product that isn’t the oil itself would have to be the household cleaner. I mean really, what can’t it do? I also always have Thieves wipes in my son’s diaper bag for tables when eating out & shopping carts! I absolutely LOVE thieves and haven’t tried a product I haven’t fallen in love with! Thieves is one of my all time favorite oils! I always have two bottles on hand for immune support and I can’t imagine not having the thieves household cleaner in my house. It’s definitely a must have! My favorite Thieves product is the oil. If all the others went away, I could still make something close to them if i have my bottle of oil!! My favorite way to use Thieves. Wow! That’s hard! But I love to clean with it! I love Thieves Eo, toothpaste, and cleaner! I can’t wait to try the other products too! Great podcast! All thieves products are amazing!! Love thieves and all the thieves products! What fun! I love thieves!!! I like to use theives when making granola in place of the cinnamon. Love cleaning with Thieves and the way it makes the whole house smell wonderful! Very interesting story on how Thieves got its start. Thieves tea ALWAYS saves the day! I also love my Thieves cleaner! I LOVE Thieves Essential Oil! It is wonderful to diffuse. It makes my whole house smell marvelous. Can’t say enough about this wonderful oil! We use Thieves everyday at our house! We absolutely love all the Thieves products! We’ve completely replaced the toxic cleaning chemicals we used to use with Thieves household cleaner. We use Thieves toothpaste and mouthwash. You could say we have a household of Thieves lovers!!!!! We love ALL Thieves for everything! Cleaning, on popcorn with local raw honey, in a warm tea, you name it! My favorite Thieves product is Thieves Household Cleaner. The wonderful Thieves aroma and a super great cleaner combined in one concentrate. Love THC ! I think the story of Thieves is one of my favorite oil backstory. The household cleaner has been such a life saver for our family. I am so extremely grateful for what this product has done for our family. Thieves is a life saver! From cleaning to diffusing to a few drops in my hot tea or on the bottoms of my feet ..by far my favorite YL essential oil. Would love to some day try the laundry soap! I love thieves essential oil and thieves cleaner! I make my own all purpose cleaner with Thieves, Mrs. Meyer’s Apple Cider dish soap, vodka, witch hazel & water. Works on every surface and my home smells fantastic! I use Thieves on the bottom of my feet every night and morning. I put a drop on my toothbrush at every brushing. I also diffuse it with orange. I use the laundry detergent, the hand soap. I also use it to wash floors, spray on my linens every morning after I get up. Needless to say I use it for a lot of different uses including to clean out my Keurig. 2 drops of Thieves in my herbal tea with a few drops of Lemon. 2 baskets of our favorite Thieves products?! I would swoon if I won ? Thanks for the awesome giveaway! I use Thieves for so much in our personal care and around the house. My funny story is how much our cat likes it too ? Whenever I use Thieves, he follows me around the house trying to lick it off my hands and get me to pet him. Maybe YL could look into developing Thieves pet treats? YL podcasts are great to listen to and share with friends! Thanks for the tips, Haley. I need more Thieves! I want to Share the LOVE! We love Thieves in the diffuser. Thieves Spray is my favorite, because it has so many uses, and it is portable. We LOVE thieves! We use it every day. I even use it at work. Please pick me I will definitely use these products! I love everything about Theives! I particularly love the theives cleaner! I use it everywhere in my home. Mmmm…. Thieves. I LOVE the way it makes my house smell and how well it works for my family and I. <3 If you don't have it, you're for sure missing out. Thieves household cleaner is the only cleaning product I use now! I love everything about thieves. I love the smell so I add it to my diffuser, I add thieves to my tea with a little honey everyday. I put Thieves on my feet every day. Thieves is an oil I can’t be without. I love diffusing it at my desk. I need more thieves! ”Tis the season! I love to add a drop of Thieves Vitality oil added to my Thieves Aromabright Toothpaste & my Thieves Mouthwash. I also put a drop or two in my diffuser necklace during this time of the year! I love that I only have one cleaning product, Thieves Cleaner! Love thieves. Helps my family lots. I love all things thieves! But my two most favorites are thieves eo and thieves cleaner. I use the oil in capsules along with oregano and frankincense in capsulesI use it in my homemade foaming handsoap, in my homemade toothpaste and anything else I can come up with. And the cleaner is awesome!!! I clean everything with it! I am new to Young Living Essential Oils, and I am excited to learn new uses for Thieves Essential Oil Blend. Right now I diffuse it and add it to my Wool dryer balls. We love that you created Thieves. In the last year there’s nothing in our daily life that doesn’t include Thieves. Thank you so much for your wonderful contributions, Young Living!! I don’t know where we’d be without you. #love #tradition what a great story and origin … It’s a great way to share ! wow, I never heard Gary tell the Thieves story before! It is so hard to pick my favorite Thieves product. I think Thieves Essential Oil because of how well it supports my immune system! Happy birthday, Thieves! You are amazing! I am hooked on thieves since starting with YL 1 year ago. I use the toothpaste, mouthwash, and oil blend on my whole family. My favorite thieves product to use is the thieves spray though. Love thieves! I used Thieves cleaner and baking soda to clean a huge stain on my living room carpet. I had dropped a pasta dinner (with lots of olive oil) on the carpet and NOTHING was working. None of the usual household cleaners did a thing! I scrubbed a paste with Thieves & Baking soda into the stain, waited a couple hours and then vacuumed up the mess. The stain was gone! I’ve used it to spot clean other areas of my carpets with similar success. I would never give up my Thieves Cleaner! Thieves!! Love love love. Love that hand sanitizer and the floss too. I cannot get enough of Thieves! Slowly building my collection of products. Such interesting information in this podcast. Thank you! Love Thieves! It is my go to for everything! It is the best!!! A little Thieves in my coffee or tea usually perks me right up! I absolutely love all of the Thieves products that I have tried but by far my favorite has been the household cleaner. It cleans so good & smells fabulous! We LOVE Thieves in our house. Rol ons, soaps, drops, diffusers, and to clean EVERYTHING. It’s in our purses and backpacks and cars too, we are never with out our Thieves! Love thieves!! Works great and smells awesome! We love our Thieves products … every. last. ONE! Toothpaste, Household Cleaner, Hand Purifier … the Essential Rewards Thieves Kit is the BEST value! If you order regularly and aren’t on essential rewards you are MISSING OUT! A drop of thieves in my morning coffee. Kick starts my day. Love Thieves! I use it for everything, all the time! Love thieves “everything “! I mix 1 capful of thieves household cleaner with five drops lemon one cup of baking soda & used to clean my sinks tubs toilets and pots and pans in the kitchen! We love Thieves on our feet all year long. Thieves is my absolute favorite oil. I use it almost every day. I love the cleaner, but the oil itself is the best! I even use it in my laundry. Thieves is my go-to essential oil! I put the oil in tea! I only clean with the household cleaner. I only use the aromabright toothpaste and the mouthwash. I can’t pick a favorite! My favorite Thieves products are the Theives Spray and the small travel size Thieves hand sanitizer. I never travel anywhere without these in my purse. I use all the Thieves products, but have especially loved the Toothpaste. Aside from the original Thieves Oil, my favorite would be the thieves cleaner. I LOVE being able to clean and breathe at the same time! No harmful fumes and I am confident that my surfaces are actually getting clean! I even let my kids help me clean using Thieves Cleaner!! I put Thieves Vitality in my morning coffee. I love Thieves oil. It is our absolute favorite oil! Thieves is my favorite! Love the oil, the cleaner, the hand purifier, and love Young Living! Love theives! I use the original daily! As well as replaced all my cleaners with it, toothpaste and mouthwash too! Love my Thieves! It’s a great tool to have in our toolbox. I am new to YL and so far have loved using the Thieves oil in a diffuser in my kiddos rooms. After listening to this podcast I plan to try the cleaner with oil on my wood floors and furniture. Also I really enjoyed listening to the history lesson on this oil!!! I love the thieves cleaner because because it’s so versatile! I have replaced all the household cleaners with various recipes using the cleaner, including the carpet shampooer! Thieves was out 1st introduction to YL oils years ago when we made a spray to spray in hotel rooms because our son was on a traveling soccer team so we traveled A LOT! I wouldnt make it without my beloved Thieves! Loved hearing Gary tell the story of thieves. The thieves products are the best!! I love all the thieves products and use them all, but I will talk just about the Thieves household cleaner: I love that I don’t have to carry 20 different products up and down the stairs. I love this product so much! I have only tried the thieves essential oil but I will tell you that it is so amazing!! Not only is the smell great but we have been diffusing it regularly. I absolutely love Thieves! It is a staple in my household and I use it everyday! We are Bethievers!!! I use the Thieves household cleaner in my home because I know it is safe to use! Love the fragrance too!! Mmmmmm thieves essential oil! What’s not to love ❤️ really between diffusing, cleaning, making into tea, brushing your teeth and gum massage! Honestly is there a way to not use it and love it? Our family loves Thieves ? This is my go to oil. It is my most used! I love it! I love Thieves toothpaste! My teeth feel like I just came from the dentist! My home will never be without Thieves. It smells amazing and is so supportive when we feel like we are falling below the wellness line! Love thievses essential oil and the cleaners! I love Thieves! I use all the Thieves products and love every one of them. My favorite way to use it is on our feet. I love the thieves cleaner! I clean everything with it! I also love the thieves vitality EO I add 2 drops to my water that I drink throughout the day. The thieves hand sanitizer with work with the public it has helped me! Its in my nightly mix of oils for my feet, along with Sclaressence, Lady Sclairol, Endoflex, and Dragon Time. I live the Thieves essential oil. I diffuse it at night, put in the clothes washing machine, rub on my throat/chest! Love Thieves. Thanks so much for sharing the history! Great to hear the Thieves story on the podcast! I’m very new to Thieves and was very happy with the household cleaner when i used it for the first time the other day. First time I’ve cleaned and not had to worry about the fumes or sprays i was inhaling. I love my Thieves! The cleaner is absolutely amazing! I’m hooked! This changed our life ! I love using thieves to clean. I love knowing my children can help me clean wo worry about all the chemicals. I love Young Living Thieves Essential Oil! It is my favorite oil! All the amazing Thieves products have made such a great difference in my family’s life! I’m sooo thankful for Young Living and their commitment to the products! I like be Thieves Cleaner, I use it for everything, literally! I absolutely love the household cleaner! My favorite Thieves product is the essential oil blend. No, it’s the Household Cleaner. No, wait…the laundry soap. I love it all!!! Thieves is one of our favorites!! I love using thieves cleaner to clean my toilets and bathrooms it’s like an all in on cleaner. I like the thieves hand soap!! It’s my favorite, however I am in the process of trying all the household thieves products. Thieves oil is my favorite! I can’t wait to try the toothpaste!! I LOVE everything Thieves.. When I first enrolled I knew I wanted the entire Thieves line to get started on my journey. So along with the Everyday Oils Kit at that time I enrolled with ER to get the Thieves ER kit so we could replace other products in our home. As soon as it arrived we went through the house replacing. Thieves is one things we are never without.. Thieves oil, household cleaner, toothpaste, laundry soap, dish soap, cough drops, hand spray, hand sanitizing gel, and the list goes on. Thieves smells better than anything! I’m a Thieves addict! I love, love, love the Thieves cleaner…. the toothpaste… the mouth rinse… & even the floss. Who knew I could get excited about floss? Most of all I love adding it to the bottom of my feet, roller bottles, spray, & my diffusers. My Great Nephew pulls up his shirt, & says, Make me smell like Christmas!” – he loves the Thieves oil & distilled water spray :). Theives essential oil is my #1 go to theives product but of course I love them all. Love, Love, Love ALL my Thieves products from Young Living!!! I’m just starting my oily journey and I love, love, love Thieves. I used it in my diffuser and in a blend so far. I want to try the cleaning products next. Thieves is one of my faves. It works wonders. when I started with young living the first thing other then oils I wanted was everything thieves.. I have cleared out all chemicals in my home for thieves.. I use the tooth paste soap hand soap dish soap laundry soap and of course the new thieves cough drops. I use Thieves for support! I started using Young Living Essential Oils in my everyday wellness routine!!! I love Thieves! I mix it with coconut oil, honey and Lemon eo and make little disks I drop in my tea! I am new to EO but fell in love with thieves products..no regrets bring YL members. Love the Thieves household cleaner and how Beautifuly it works! Absolutely love all things Thieves! Thank you so much Gary Young! Thieves was the first oil in my starter set I fell in love with and still one of my top 3 favorites to this day! I love teaching guests at classes about going chemical free and using Thieves household cleaner as a alternative to other cleaners! I absolutely love thieves oil. I hope to soon afford to expand from the oil to all of the thieves product line. Wow! Can’t wait to build up on thieves products. I put a drop on my toothbrush add some YL toothpaste and brush! Thieves is my all time favorite. So many things it’s good for. I love what the toothpaste does for my teeth and the way it cleans….I could go on and on! Thank you for this opportunity!! I will never be without it ever again. I especially love my Thieves tea and honey/Lemon. Thieves for all thing, but my fave is Thieves toothpaste, seems like the perfect way to spread Thieves Oil through my body. This stuff is amazing! I apply it directly, wear it in an aromatherapy necklace, diffuse it and drink it in warm water with a little honey. I love diffusing thieves and using it in my cleaning. Don’t know what I would do without it. Love all,my thieves products… Couldnt go without them.. Just started using the laundry detergent and i love it ..
Really hard to choose. I will go with thieves oil. I was so happy to find Thieves cleaner and laundry soap. Thieves is soo good smelling! I can’t be without Thieves Essential Oil. I put it on the bottom of my feet every day. I also use Thieves Foaming Soap, cleaner and hand sanitizer. Great products. I love to make a roller bottle of Thieves with DiGize and apply to our feet when we are not feeling our best. Love Thieves, Thieves, Thieves! Did I mention I Love Thieves ?? I love thieves, and so does my family! My children are always asking for me to put thieves on their feet every night! We are always using it in our diffuser, it smells amazing!! Thieves is one of our favorite oils, that’s one of the oils we can’t live with out!! I use Thieves as well for all my cleaning needs. I’m so grateful that she introduced me to your brand. Now I’m spreading the love with all my friends and family! I love all the Thieves products from the essential oil to the multi cleaner and and even recently the thieves aromabright toothpaste! I love making own own DIY hand sprays and soaps w thieves and even a thick thieves paste for oven cleaning! Thieves oil is what got me hooked! Love my spray, oils, cleaner and more! love using Thieves. only great smelling Thieves! I love Thieves household cleaner! It has been a lifesaver this baseball season! I pre treat my sons pants with it!! We love the Thieves concentrated cleaner, it cleans so wonderfully and smells so great! Love learning new things about the products i love so much. Thanks for the story D.Gary Young. Thieves is my favorite! I love to add a drop or two of Thieves Vitality to my tea – either hot or cold. Thieves cleaner is the only cleaner used in our home now…can’t wait to add the other Thieves products to our household! Thieves is awesome! Good luck all! I love putting Theives in my feet and my kids feet! Amazed with the results I have seen using the Thieves Household Cleaner! My 12 year old daughter can use it to clean and I dont have to worry! My favorite Thieves product is the household cleaner. It cleans everything so wonderfully with out streaking. And the fragrance is so amazing. I just love having my house smell clean and fresh and this does the trick. Works great when you add it to your handsoap and toothpaste! Thanks!!! Love the cleaner, it’s so versatile. I love all Thieves products but my favorites are the original blend of Thieves eo, the Household Cleaner and the Thieves foaming hand soap!! I love to use Thieves household cleaner to clean my whole house, especially the bathrooms. I used concentrated Thieves cleaner to clean my oven & it made it sparkling clean like a new oven! Theives is my everyday oil. I do not leave home without it on my feet. I love it! I love all the thieves productline specially the cleaner and I make my own Tea using the thieves vitality and Lemon vitality , cinnamon bark and ginger in warm water with some honey , I call it superhero tea . I also been diffusing it for the past 3 months non stop. I am addicted to thieves oil . LOVE all the thieves products. Especially the household cleaner, fruit/veggie cleaner, and the laundry detergent! Thieves Vitality tea with Lemon Vitality is one of my favorite ways to use it. I use Thieves in my home and my classroom. My students have come back a year later and state how much better they liked my room ‘because of that thing’ (aka: my diffuser). ? Love my Thieves products!!! Can’t teach without it!!! Love how it cleans my laundry & with SO little! I just had my first oil party and sold 3 bottles of thieves.By far the most popular oil of the evening. I did know the story behind thieves oil and shared it and I think it was very convincing that thieves is a fantastic. I make a roll on combination of thieves, lavender and lemon. I put this on the bottoms of my children’s feet. So far so good! Thieves is my go to to support health. Thieves products are my favorite from Young Living! I love how clean my house is after using the cleaner. We use Thieves essential oil daily as well as the cleaning and oral care products! My favorite way to use Thieves Essential Oil is to simply run it on the bottom of my family’s feet! This is just one of the hundreds way that we use Thieves products on a daily basis in our house! Thank you YL for an amazing product line that we can trust! My family LOVE LOVE LOVES THIEVES! We share this EO all the time!!! I just started using the thieves mouthwash and LOVE it! No more store-bought for me! I love Thieves Household Cleaner. I use it for countertops, tables, mirrors, glass and floors as well as my bathroom. Love all the Thieves products, but love the oil best of all! Every day I wear an essential oil pendant infused with thieves essential oil. Next to lavender, thieves is my go to essential oil. I absolutely love thieves cleaner on everything in my house. Especially for cleaning windows!! Am excited to try all of the other thieves products! I love all things Thieves (essential oil, cleanser, dish soap, laundry soap, hand soap, toothpaste). My favorite is the thieves oil; however, I also love the cough drops and cleaner! I use several of the Thieves products- toothpaste and mouthwash (daily), essential oil, lozenges, laundry soap, dish soap, dishwasher detergent AND household cleaner. The one that pops first in my head is the household cleaner. One cap in a spray bottle with distilled water for cleaning most anything. No toxins and safe around kids and pets. Awesome! Happy 25th Anniversary Thieves! I love to use thieves in every single room in my home! Also thieves on the go ?????? Love Thieves- it smells amazing! I enjoy the variety of uses that Thieves essential oil provides…from air freshener to all purpose cleaner to mouthwash. This is my favorite oil. I am a teacher and I tub it on my feet every night. Thieves is my favorite. Plus I love love love the smell and the taste! I normally do not like hand sanitizers because they feel sticky. But the Thieves Hand Santitizer isn’t sticky & it smells amazing! I have just recently started using the Thieves Cleaner and am very pleased with how I can use it for so many different applications. Thieves is #1 in my book! Love, love, love the Thieves Aromabright toothpaste. I love love love Thieves for cleaning, diffusing and am anxiously awaiting to use the cough drops…. I absolutely love Thieves and the history behind it! Not only does it smell wonderful, its health benefits are incredible!!! I love how versatile it is! Remarkable product! I absolutely LOVE Thieves!!!! I make my own spray for all the dog beds and furniture. It is amazing. I recommend this oil to all of my friends and family. I am loving the mouthwash! Thieves is awesome!! I love all of the product line! We love Thieves and honey in tea. This oils is so amazing! I just can not get enough! Thieves tastes good and smells good too! I absolutely love to clean the house with it as well! I am still fairly new to YL EO but am loving the journey. Thieves has been amazing for making my own wipes and for diffusing alone or with others. Thieves is my favorite! I use it for perfume many days. 40 Thieves is an amazing story! I love, love, love how it evolved to the awesome products we have with YL! Keep making all things Thieves! Thieves Cleaner is a miracle in a bottle! I use it for everything. Knowing it’s safe to use around my grandbabies-even better! Thieves oil is a saving grace in my house. I love love love it. always loved this for working so well! I love to use Thieves and coconut oil in my feet. Thieves smells so energizing that we love diffusing it and wearing it on the soles of our feet. Just tried this recently….love it! Don’t know exactly how I cleaned the glass top stove before Theives household cleaner. Absolutely love all the Theives products. Excited to try the dish soap and laundry detergent. This is such a cool history! I love this blend and all the other Thieves products I have tried. I love using thieves right before I go to sleep! This is awesome! Thieves and thieves cleaner are definite must-haves in our house, and I don’t know what I would do without them! My favorite! I spray it everywhere! I love Thieves spray. I bring it to work and use it on my hands all the time. Thieves is my absolute favorite Young Living oil. I am so thankful for all Thieves products. Thieves Household Cleaner is my favorite cleaner to use around the house. It smells fabulous and it is so safe to use around children and pets. Thieves Hand Cleaner akso works well. Love me some thieves…..❤ It was my first youngliving product! my favorite is the household cleaner. Amazing product and since using it I have used anything else. I use it for everything. I have to share my story with you. I placed an order for the thieves cleaner and lozenges along with other products and oils. It was early winter so the cleaner froze and broke open. The shipping must have been rough as most of the bottles were broke open. The lozenges bag broke open also. When the order got to my door I opened it and right away I put the frozen chunks of thieves cleaner in a glass bowl. The lozenges were all over the box with cleaner on them. I couldent throw them away. So I threw them in my toilet tank. I was absolutely thrilled as my toilet was so sparkly clean and smelled good 🙂 So that’s my thieves story. We love theives around our house! Such an awesome story! Just ordered my first kit and I’m excited to try out Thieves!! I’m so grateful to have Thieves products in or home. I would have to say thieves cleaner is my favorite but could not be without the oil rubbing on the feet either. Thieves is my go to oil for everything. I especially love it this time of year. Would love to try thieves! I’m new to YL oils! I’m new to oils. I’m excited to learn about them! Thieves is my favorite! We rub it on our feet. The household cleaner is the only product I trust in my kitchen and bathroom. Plus it smells amazing! I love hearing the history of the 40 thieves that inspired this oil! I use it in everything…my cleaners, hand soap, laundry, water, tea, diffuser, typically…would love to get a basket! I use thieves quite often in capsules, tea, and I also use thieves cleaner! It is a muat have in my stock! All Thieves products are amazing! I regularly use Thieves toothpaste, Thieves Lozenges, and Thieves Cleaner. Thieves on the bottoms of the feet is a must! Thieves hand purifier is amazing. I love the oil, but thieves hand purifier is a ready-to-go, no spill, no hassle application of the power of that wonderful oil. I love it! I’m looking forward to trying the DIY’s. I diffuse and clean with thieves. Y house sells so great! I love Thieves! I cleaned my house one day with my Thieves cleaner and a friend came over. He goes Penny your house smells so clean. I told him what it was and he wanted some. Goes one everyone’s feet every night! I have loved Thieves since I first experienced it!!! I especially like the toothpaste and mouthwash. I began using it a couple of months ago and really love that my mouth is so clean, and no toxic chemicals used!!! We use thieves household cleaner all the time, mixed spray bottle in the kitchen and bathrooms. Diffuse on feet at night! Definitely need to diffuse when at hotels!!! I’m just learning about Thieves many uses…love it so far. I love the Thieves EO and I use it in my tea, diffuser. and on the bottoms of my feet but I really Love the Thieves Household Cleaner! It is my favorite. The energy of the this cleaner is so good and leaves my counter tops feeling wonderful. Thank You! Wow! I didn’t know the whole story about Thieves- so glad I listened! Thieves is one of my favorite oils…love to diffuse and love to add to my tea. I love Thieves essential oil so much. I use it every chance I get. I’m actually making some thieves inspired food/drink items for Thanksgiving dinner! So versatile and fabulous! Thanks YL! I love the whole Thieves line, I use every product. Especially like making a cup of Thieves tea. Thieves is one of my favorite YL oils. Thanks YL!! LOVE thieves and orange in the diffuser, this time of year! I love using thieves every day!!! I made a roller to use in my spine & the bottoms of my feet. All the puffy hearts!! It’s a lil powerhouse oil. So thankful for Young Living and all the wellness you provide to my family!! I LOVE Thieves!!! I want to get every available product!!! Love the oil, the vitality oil, the laundry detergent, and just got a bottle of the cleaner!!! I diffuse it EVERY day in my classroom. Thieves ! I so love you in our mouthwash, throat spray & foaming hand soap! I am so impressed with Thieves…made a believer out of me..
Love Thieves oil. A couple drops of oil on my throat throughout the day and I am great! Plus people are always asking what smells so nice when they are near me! I never leave home without the Thieves oil blend! I also LOVE the Thieves HouseHold Cleaner we use it everyday! We love the whole Thieves line and it’s been such a blessing for our home! I love to clean my whole house with Thieves!!! The Thieves toothpaste mouthwash and foaming soap are outstanding!!! I can’t forget to mention washing my linens with Thieves laundry soap and thieves spray on my dryer balls!!! My mother’s favorite diffuser oil is Thieves too!!! I carry Thieves hand sanitizer everywhere I go!!! What is not to love about Thieves!!! It’s a toss up between the toothpaste and the oil and you can’t have the toothpaste without the oil. So Thieves oil wins! I love thieves cleaner and oil in diffuser!! My favorite is the cleaner! I especially like to use it in my classroom! I also have Thieves oil in my diffuser every day. My favorite to use in my diffuser. I’m new to using YL oils so I haven’t used all the different thieves products, yet, but I will! My favorite way to use Thieves is to just open the bottle and inhale deeply. Ahhhhh! It lifts my spirit! I love Thieves!! It’s so versatile and amazing to use!! I absolutely love thieves! I just went to my first make and take all about thieves and the thieves cleaning solution! Have never been so excited to start cleaning! Thieves oil has changed my home. This is what started my entire obsession with young living oils. Thieves is my most favorite! The way I use thieves mostly is for my wool dryer balls. A couple drops of oil on them with also using the thieves laundry detergent makes my close so clean and smells absolutely amazing!! The best ever! I can’t get enough! I love to use a few drops of thieves essential oil to the water in my steam mop! I love the oil Thieves, it’s so perfect this time of the year. I am a huge Thieves fan! I first fell in love with the hand soap. It’s makes washing your hands like a aroma therapy experience! Hands down my favorite oil, use it every day. Love the cleaner as well. Love thieves to diffuse, always use it when i have a house full of people, everyone stays happy. Also love using thieves household cleaner, have my daughter hooked on it as well. Three little kids…..thieves is a must in our household!!!! I love the scent of Thieves, when I am cleaning, I spray Thieves on the floor to mop, in the air as an air freshener, on the carpet before I vacuum, and on my curtains. I have the Thieves wipes and diffuse Thieves in my diffuser. I have the toothpaste and hand sanitizer as well. I also add a drop of Thieves Vitality to my water. I also have Thieves foaming hand soap and cleaner. I love this oil! I love to diffuse thieves, roll it on my feet and my children and add some to my tea! I am new to essential oils & Young Living. I absolutely LOVE Thieves! I love Thieves! It’s what got me started with Young Living!!! Love the Thieves line!! Especially the mouthwash! so grateful to have this in our home! Thieves spray and hand purifier are always in my purse. Diffusing Thieves especially when people visit us, love all the Thieves products, using lots of Thieves oil, it is simply amazing. Thieves, oh Thieves!! Let me count the ways I LOVE using Thieves!! The oil, toothpaste, cleaner, dish soap, laundry soap, hand soap, bar soap, spray and dishwasher detergent. Not sure how we ever survived without it before because we certainly can’t now. And with a family of 10 we use a LOT of it!! If I had to choose just one product I guess it would be the Essential oil so maybe I could DIY some other stuff with it. But sure am glad I don’t have to do that. We use thieves in everything at my house. The cleaner is amazing, we have wipes, spray, even homemade laundry soap. My kids love the toothpaste and won’t touch kids toothpaste they say it’s gross but love the thieves aromabrite! All of us use a swipe on our feet! Love this stuff and thanks for the story! Love using my Thieves cleaner. I’ve made myself a thieves roller. Also love my Thieves bars of soap as a prewash for my daughter’s dirty clothes. really love thieves..the benefits are jaw dropping!!! I love all of the Thieves products. The household cleaner is probably my favorite, but I also often use the hand soap, toothpaste, laundry detergent, etc. I put a drop of the oil under my tongue or in my tea in the mornings. I enjoy the scent and appreciate all of the products. All of the products are great but the Household Cleaner is amazing in that it cleans but also because it leaves such a nice scent instead of a chemical one. Loved hearing Gary telling the Thieves story! I am new to essential oils….but I am sold on thieves! LOVE Thieves!!! We use it in our house about every day. And there are so many products with Thieves in them!! Can’t ever go wrong!!! I love Thieves essential oil for everything from cleaning products to laundry to tea to freshening the mouth to diffusing…. So much more. An oil you can’t live without. My favorite way to use Thieves is in my homemade toothpaste! I love Thieves and all the Thieves products I’ve tried so far! Thank you for this opportunity! Love the entire Thieves line! I use the EO, toothpaste & cleaner daily. I love all the Thieves products but if I had to pick just one it would be the Thieves essential oil. With the oil I can turn it in to all kinds of my favorite things! Thieves Tea is a great way to start my morning, sometimes I add a couple drops to my Ningxia Red, diffusing is always great plus adding a couple drops on a cotton ball and leave in my car AND Thieves HH Cleaner has SIMPLIFIED life! Thank you Young Living! I love cleaning my house with this, knowing that it’s chemical free! Wonderful company with wonderful products! Thieves is amazing. I love every product in the line. My daughter and I volunteer at the animal shelter wher we have to wash our hands after each contact with one of the animals. The harsh chemicals in the hand sanitizer they use made a mess of our hands so now we each carry a small bottle of the Theives hand sanitizer everywhere we go! It is one product I can’t go without. If I could only have one oil, it would be Thieves. Thieves is essential when you’re a teacher. I wear it, diffuse it, and drink it in Tea with lemon and honey. Ever since I met Thieves, I can never go without it now! Simply the best. I never knew the full story behind thieves. So interesting. I love thieves cough drops. I make my own thieves foaming hand soa but I really want to try the cleaner and toothpaste. Oh my goodness . Theives is unbelieveable . I had a friend who started her own house cleaning business and she bought a bottle from a YL friend . She said one woman she used to clean her house loved the smell . As for me . Cleaned my windows inside and outside in Oc i swear they looked like i cleaned them today . So cheers to Gary Young for introuceing us to Theives cleaner and oils . I have used everything I could find to get rid of hard water stains on our oak floors but nothing worked. 2 drops of Thieves oil in hot water and a sponge and it was gone! This stuff is amazing!! 24/7 diffusing Thieves!! Makes me feel GREAT smelling this all the time. It is serious MAGNIFICENT ?❤️??? 24/7 diffusing Thieves!! Makes me feel GREAT smelling this all the time. It is seriously MAGNIFICENT ?❤️??? I clean my house with thieves, use thieves in my washer, made thieves wipes and cough drops! I have my 80 year old mother using the thieves wipes made with coffee filters to clean everything! I love my thieves mouthwash the most ! But I don’t go a day without something from the thieves collection! Thank you so much for a wonderful product line! One of my favorite ways to use Thieves is diffused with orange. The smell makes my home smells so wonderful. Theives is one of my favourite oils . I am enjoying learning more ways to use it. Thank you Gary and YL for this super product. Love my Thieves cleaner and essential oil. I love Thieves, It’s the #1 must have! I use the various Thieves products both at home and with my clients. So very refreshing to have these products at hand! I didn’t realize Thieves has been around for 25 years; hooray!! Can’t go without Thieves products! Cleaner, toothpaste, mouth wash, EO, etc. just ordered the lozenges. Made sugar scrub today with thieves! Love diy with EO’s. Thieves is the first essential oil I was introduced to. I use Thieves for cleaning and many other purposes. Thieves was and is my favorite blend. I love being able to use it for SO MANY things!!! Love everything Thieves! So glad I have this oil. It’s hard for me to choose my favorite Thieves product! But if I have to choose ONE, it would be the Thieves Household Cleaner! It’s so versatile that I can use it in sooooooo many ways! Thieves is one of my favorites. I love the oil but also toothpaste, hand soap, and especially household cleaner. I use Thieves on my dryer balls,; I use Thieves products to clean my house and teeth! I anoint my feet every morning with Thieves oil and wear it around my neck in a diffuser necklace! I even use the Thieves toothpaste as a deodorant! I love our Thieves products! Thieves makes my world a better place! I use Thieves household cleaner all over the house without worrying about it affecting my little ones. I also rely on the throat lozenges daily. Thieves in my diffuser with an extra boost of citrus makes me very happy! Thieves is fantastic no matter your preferred method of use – aromatic, topical, or ingested. We love to fill our home with the wonderful smell! I ❤ Thieves. I add Thieves to the home made soap I make & everyone I give the soaps to absolutely loves them. My Husband loves to put it in our electric defuser. Thieves is my favorite oil to diffuse in fall and winter, also the cleaner is amazing! I have smelt a couple knock off thieves oils and they can not even compare to Young Living. Thieves is my favorite oil for all of its benefits through all seasons. I use at least one drop every day. Anything Thieves is absolutely amazing! Life changing! I love to diffuse Thieves essential oil – the scent is amazing! I also add a drop to a mug of black tea or hot apple cider for a spicy fall flavor. it’s delicious! LOVE LOVE LOVE the oil, cleaner, toothpaste and mouthwash! I’m new to oils so those are all I have tried this far, but I can’t wait to try the others too! I travel for business regularly. I NEVER leave home without my Thieves. It helps to support my immune system wherever I am. I can’t go a day without using, at least, one Thieves product!!! I absolutely love the entire Thieves line! Thieves is my all time favorite essential oil!!! I have just beginning with young living. I can hardly wait to get started cleaning with thieves. Thieves is great in my defuser, I love the scent so much! I love thieves oil. I use it everyday. I love thieves oil….there are so many possibilities for use like mouthwash, toothpaste, cleaning -especially sports clothing! I can’t live without it! I can’t imagine life without the thieves line of products. There isn’t a day that goes by without using them. Thank God for leading me to Young Living. I was introduced to Thieves oil first at a time when I was really trying to support my immune system. It remains a favorite oil of mine. I love Thieves! I use the household cleaner for everything in my house. No more chemicals. I love to diffuse Theives. It smells great and benefits my entire family. I’m a “thieveiever”! I use thieves products every chance I get! At home, at work, in the car, and more…I don’t know what I’d do without all the amazing thieves products! Absolutely love the Thieves products and the story behind it! It’s helped us clean our home and recently, using the toothpaste. Smells amazing also. Thieves and rx are a miracle combo at our house! I am a big fan of all of the Thieves products. I think the Thieves household cleaner is one of my favorites! Thieves is what got me hooked. A couple drops of Thieves EO in Hot water, makes for a comforting, and soothing, relaxed winter day in, by the fire. Twice a week a drop of thieves on my toothbrush in the morning, motivates me for the long and crazy day, while preparing me with the extra tingle and delicious fresh deep breath as I take on the day. Thieves in my diffuser with a drop of Orange, helps bring in the holiday season. The aromatic Ora that flows through the house, even days after diffusing, encourages beautiful new memories being made and whispered hints of old memories remembered. We love our YL EO. What would we do without this blend. Truely amazing ? Love making homemade cleaning wipes with Thieves! Cleaning never smelled so great! And the all purpose cleaner works fantastic on my floors! I am learning about the many uses of Theives and every idea or product I try I fall more deeply in love!! ? Our entire family loves and uses thieves! A must have oil!!! I love putting a drop or 2 in a cup of hot water for a nice warm cup of tea. Thank you YL! Absolutely love everything about Theives! The smell is amazing, can’t wait to try all the Thieves products! I love the new Thieves cough drops. I also still use the original Thieves drops as well. I love all the Thieves products! Especially love the cleaner. I use it in my laundry, on my counters, appliances, sinks, showers,?mopping my floors, cleaning my toilet, woodwork and washing windows. Also, is a an excellent stain remover for stains on carpet. The uses for Thieves cleaner is endless! Love Thieves one of my favorites! ! I love all thieves products but especially the essential oil. We joke that I just always smell like it – it’s just a part of me now. Just about every jacket has a little roller that i’ve made up. I’ve been wanting to get some! Thieves toothpaste is my favorite! À1I’m a huge fan of the fruit and Veggie wash as well as all thieves products. Happy anniversary Thieves. Love to diffuse thieves all year round. I add a drop or two of orange with it sometime, mmmmmmm. Thieves essential oil is the best ! Thank you so much for bringing the history lesson behind Thieves to the forefront. Thanks for the DIY tips that we can start using immediately. Thieves was one of the first oils I started diffusing as I felt energized by the aroma. I LOVE Thieves Toothpaste, Thieves Cleaner, Thieves Mouthwash , Thieves Spray, Thieves Laundry and Dish Soap, Thieves Hand Sanitizer. Thieves Oil. I just can’t pick ONLY one but if I must I would go the the Thieves Oil. We Love us some Thieves Tea! I add thieves to my tea, my mop water, my diffuser. We cannot get enough of our thieves oil! I value all things Thieves, so choosing one is difficult. I’m going with the original Thieves EO blend for its versatility in making everything and supporting the wellness of my family. Such a generous giveaway! Thieves is a must have in our home from the essential oil to the toothpaste, detergent, hand-soap, etc.! I couldn’t image a day without it! My family has saved so much money on products by making the switch to something so pure and wonderful! LOVE Thieves! All Thieves all the time! Our favorite is the toothpaste and mouthwash! I love Thieves Laundry Detergent. It’s the only detergent I use now and because I have a HE washer, I only need 1/4 cap full! LOVE Thieves! I use it for cleaning and to support a healthy immune system! I love using thieves from head to toe on myself and my house. Everything from toothpaste to household cleaner to DIY laundry Detergent. I also put a drop in my Ningxia Red shot everyday! Thieves Cleaner is an absolute must in my house. It cleans everything and I don’t have to worry about kids or animals being around while using. And after what it did to hubbys work truck – I will never be without. Loved the history behind Theives! I’m newbie to Young Living and currently use my Theives in my diffuser. Looking forward to trying the rest of the line! I ordered the lozenges in my November ER order and looking forward to try them. We love Thieves and many of the thieves products. I love Thieves! I love diffusing it, the lozenges, and the toothpaste! I’m new to YL. Thieves smells wonderful. Enjoyed learning the history. Looking forward to trying the throat drops and using as furniture polish. Thank you for the info. I love all things Thieves – Oil, Household Cleaner, Foaming Hand Soap, AromaBright Toothpaste, mouthwash, dental floss, hand sanitizer, dish soap, etc! I have yet to try Thieves cleaning but heard great things. Cannot wait to try them and the toothpaste. Love the oil! Thieves is my go to. I make my own dishsoap and foaming hand soap with thieves. I use the thieves household cleaner and with that also make my own disfectant wipes. We diffuse thieves in our home. We also have thieve lozanges this year, too. I love the thieves oil for diffusing and the spray for my car. It’s so hard to pick a favorite, because I love the whole Thieves line! I would probably have to go with the Thieves Household Cleaner for my “top pick” though. 🙂 It smells AMAZING, but most importantly…I have replaced all of my cleaners with just this one, and it’s soooo much safer to use! This was great! Love the recipes. Had to rewind several times to get it all down. I love the Thieves household cleaner. I love that I can put a mixture in a spray bottle and spray my bathrooms and kitchen. I love that I am finally not inhaling toxic chemicals! I love thieves! My favorite is the foaming hand soap! My favorite Thieves item is the spray. I keep it in my purse at all times! Thieves is a must have around here!! LOVE THIEVES!!!!! Especially the household cleaner! We love to use Thieves Vitality in our coffee and tea each morning, and add a drop of Thieves to the bottoms of our feet before leaving the house each day! Thank You Thieves and YL?❤️? I absolutely LOVE thieves, great for defusing, to putting it on my children’s feet at bad time! I also use thieves household cleaner for just about everything when it comes to cleaning at our house. Thieves works amazing at getting stains out of the carpet to the clothes, to freshening up the bathroom! We love thieves inour home! Love Thieves for everything from cleaning bathrooms (blech!) to immune support … And the whole family loves the smell so much more than traditional chemical-based cleaners! So glad we found Thieves and YL! I love using Thieves Household Cleaner in every room of the house! It is also the first Young Living product my husband will consistently reach for instead of a toxin-laden alternative! My favorite way to use thieves EO is in a teaspoon of honey! THIEVES OIL…it is why I have Sooooo many empty bottles of it!!! Also do love the Spray and hand sainitzer! I love a drop of Thieves on a spoon of honey. Thieves is fantastic! I love to diffuse it and use topically. I LOVE LOVE all the thieves products! My favorite is the toothpaste! I will never use anything else!! Thieves Cleaner had revolutionized the way I clean my home! Thieves foaming soap! I love being confident my hands are clean without any chemicals. I’ve enjoyed blending very much. I cannot clean my kitchen and bathroom and the floors and my refrigerator with Thieves cleaner. It gives me a great feeling knowing I’m cleaning with something potent yet safe. Love. I also love adding thieves oil to all my rollers for the extra boost. Love Thieves, its by far our favorite oil as a family! Thieves laundry detergent is amazing. I know our clothes are getting clean without all of the chemicals, and they smell good too! I love Everything about the oil! bottom of feet, behind ears, on neck, on chest. And it smells so good! Since I’m new to the oils I haven’t had a chance to try any other Thieves items, but can’t wait to start! Thieves EO is how I got started using essential oils. It was remarkable! Love my Thieves!! Thank You Young Living!!! Thieves is a must have oil! I always keep it in stock! I love to make tea with it! I am still quite new to Young Living products but I have learned that Thieves is the best thing for cleaning among other uses. I enrolled in 2013 with the Thieves Starter Kit! I love my Thieves products!! I am new to essential oils. I have heard many good things about Thieves. I plan to try them soon! My very first YLEOs product was the thieves cleaner. I bought it on a recommendation from a friend as I was trying to reduce the use of chemicals in my cleaning products. I fell in LOVE with this product and its versatility. Several months later this same friend introduced me to the oil side of Young Living! Guess what? My favorite oil is thieves because of its versatility. Oh and by the way, thieves quickly turned me into a yleo oil believer and lover. A day doesn’t go by without my use of at least 10 Young Living products!! I LOVE Thieves! Currently diffusing it!!! As an elementary teacher I love the original Theives . It is so versital. I like to diffuse thieves at home! I had the opportunity to try the thieves essential oils through a co-worker. I would love to try the other thieves products! I use Thieves as part of my daily wellness regimen. With two kids in school, it is a critical oil in my collection! I love to use thieves to help support my children’s a immune systems. I also like to add a drop of it to concur oil for oil pulling. Thieves household cleaner was my gateway oily product. I used that when my daughter tossed her cookies on our fabric chair. It was the only thing that got the smell out. I’ve been oiling ever since! 4 years strong! I love ALL the Thieves products, but I would have to say the essential oil is my favorite because it can be used for so many different things in so many different ways!! It’s always in one of our three diffusers. Love the history behind Thieves and that Gary You g was so passionate about researching it and bringing it to life! I LOVE putting Thieves in my diffuser as well as a drop in my hand lotion. As a teacher, my students LOVE when I use it. It does more than just freshen the classroom. Our family LOVES Thieves!!! We rub our feet, daily with it!! I wash fruits and veggies with it! I diffuse it! I ingest it!! It’s truly a bottled blessing!!! I love the thieves cleaner. It smells amazing and works amazing! My favorite Thieves product is definitely the Thieves household cleaner. I love that I don’t have to hold my breath while cleaning any more and my kids don’t have to leave the house while I clean. Thank you Young Living! This is great! Thieves for the win! I love the original oil blend, we roll it on our feet and diffuse all over the house! Smells fantastic! The cleaner might just be my favorite though…. So versatile and more affordable than any other product I’ve seen! Thieves is in every room of my home! Diffusers, kitchen, laundry, bathrooms – we just love it!! All things Thieves! Seriously! The oil is amazing! Toothpaste, Mouthwash, Cleaner, Hand Sanitizers and on and on. Thieves is my ABSOLUTE favorite oil. I am never with out it. What don’t I love about Thieves? I use almost all of the Thieves line but have to admit my favorites is the household cleaner. It works amazing! Thieves products are my favorite. Really only one?! I use the toothpaste everyday and love it. It was great to hear Gary share this story himself. I love using Thieves in my diffuser. It makes the room smell clean and good. I love Thieves household cleaner and all of it’s many uses! I cannot wait to try the recipe mentioned in the podcast for cleaning our antique furniture. Just straight up diffusing it! And the cleaner is just heaven!!! I LOVE THIEVES, we use it in our laundry, diffuser, for our household cleaner and I put it on my baby’s feet with a carrier oil! I love thieves tea, thieves toothpaste and mouthwash, and thieves cleaner. My favorite blend to diffuse in fall/winter. Love the household cleaner, it has replaced all of my other cleaners (except wood polish). Next to try is dish and laundry soap! Wow, thanks for this history of Thieves! This is a new one for me. I will try the 1 cup olive oil with 1 careful Thieves Cleaner for a wood polish. My house will smell great! I am so grateful for all of our essential oils and especially the Thieves line!!! I use the cleaner for cleaning almost everything! I love that it gives people an alternative to harsh chemical cleaners! I guess I carry some sort of thieves product with me at all times!!! Addicted!?! I love everything thieves and I cannot wait to add more thieves products to our household! What a great story – Happy birthday, Thieves! Thieves cleaner is my favorite, I love how effective it is. The spray is another favorite, and the oil itself I put on myself, husband. And children. Thieves is wonderful and I’m so glad I found it. Love all the different uses for Thieves! I love everything Thieves, but the products I use daily are Thieves Essential Oil, Thieves Household Cleaner and Thieves Aromabright Toothpaste. I like using it to ‘make’ my own foaming hand soap. 1/4 cup of Castille liquid soap with 8 drops of Thieves oil in a foaming soap dispenser and fill the rest with water! I love my Thieves cleaner. I carry a 2oz spray bottle with me to clean the table at a resturant before we eat! Thieves is awesome! Especially like the Thieves Household Cleaner! Thieves is my #1 FAVORITE essential oil from Young Living! My 6yo applies it every morning before school. ? I love using the theives household cleaner. It cleans so well and the best part is that my hands don’t smell like harsh cleaner afterwards. I don’t feel guilty picking up my daughter after cleaning because she isn’t smelling harsh toxins. It’d also great to out 1 or 2 drops in milk, it gives a nice spicy flavor. I just recently discovered thieves household cleaner, I absolutely love the great smell. My favorite is Thieves household cleaner!! The original store bought cleaners would give me respiratory issues every time I cleaned. Now that my kids are cleaning with me, I didn’t want them to have the same issues. Plus, I can use 1 product on practically everything in the house. Very interesting. Do like no chemical. Especially since I’m a cancer survivor. I do question does it do the job. LOVE the Thieves household cleanser spray, soap, toothpaste, mouthwash, spray, lozenges, and of course the oil! I not only diffuse it in the house but also in our office. I love putting Thieves in my Tea and coffee. But I am addicted to Thieves cleaner!! I use it all over my house!! I also started using Thieves toothpaste recently!! This is coming in my first ER order soon and I am excited to try it!